Daniel Cole has been a guitarist and musician in Cornwall for more than 20 years. 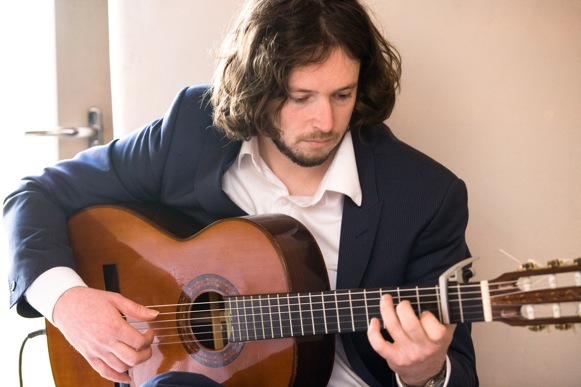 Experienced in Spanish guitar, Flamenco guitar, contemporary Rock, Pop and Folk music, Dan can offer you a tailor-made repertoire of guitar arrangements for your event. For many years Dan has been playing in bands in Cornwall like The Hitchcock Rules and Kola and graduated with a BA hons degree in Music from Falmouth University. He also performs as a solo guitarist at weddings and events around Cornwall as well as offering guitar lessons in Penryn, Falmouth and further afield. In 2012 Dan studied Flamenco guitar under Jorge “El Pisao” and Ruben Campos at the Carmen de las Cuevas School of Flamenco in Granada, Spain.